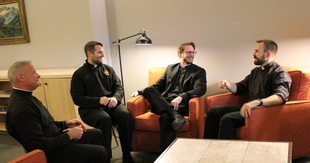 An important element of the spiritual formation program for the men in pre-theology and theology at Mount Angel Seminary is regular participation in Jesus Caritas prayer groups. Inspired by Blessed Charles de Foucauld (1858-1916), Jesus Caritas is a worldwide fraternity made up of small groups of diocesan priests who share prayer and developments in their lives. A steady witness to the importance of these groups is Fr. Richard Keolker, director of the Jesus Caritas groups and a spiritual director at Mount Angel. “There were Jesus Caritas groups already active at Mount Angel when I got here in 1991,” noted Fr. Keolker. “I worked with them, and in 2004 they became a part of the program for theology and pre-theology students.” The groups meet once a month to share dinner, Scripture reflection, a review of life, and evening prayer.